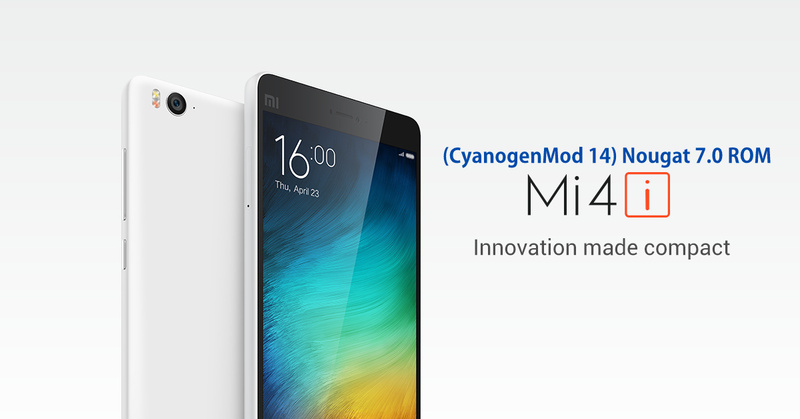 Xiaomi Mi4i CyanogenMod 14 (CM14) Nougat ROM Update is now available from an Unofficial build. Xiaomi Mi4i .Please do not try on any other Xiaomi Variants. Have Custom Recovery installed in order to install this ROM. Android 7.0 Nougat CN14 ROM for Xiaomi Mi4i and Nougat 7.0 Gapps to your computer. Connect and mount your Xiaomi Mi4i USB memory on your computer using the USB cable. pressing and holding Volume Up + Home + Power buttons together. the next screen and the installation procedure should start now. Nougat 7.0 Gapps: Repeat the above step for the Gapps zip file as well and install it on your tablet. Your Xiaomi Mi4i will boot now and it might take about 5 minutes to boot on your first time. So, please wait.